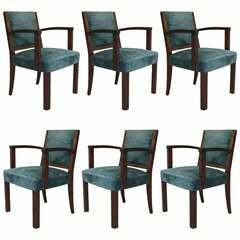 Pair of French Art Deco newly upholstered custom armchairs in a turquoise blue Lee sofa fabric. These chairs have a lot of weight to them (solid) and very comfortable. Immaculate condition, restored to new. A tall Poterie Renault Cher Art Deco two handle vase,in gorgeous blues,lavenders,turquoise and white. France 1930s. 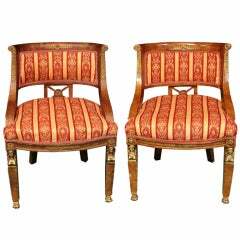 Rare Art Deco armchair which comes from a French ocean liner. 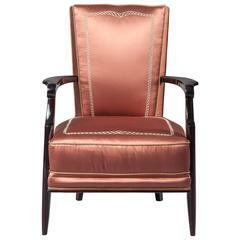 Beautifully upholstered in a silk fabric decorated with elegant embroidery which is an exact remake of the original. 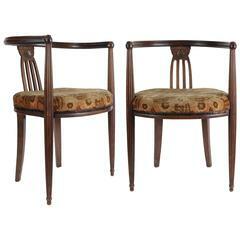 Nice pair of Art Deco armchairs, 1930s, French. With original fabrics.